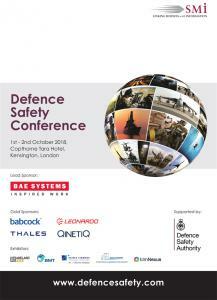 LONDON, LONDON, UNITED KINGDOM, July 9, 2018 /EINPresswire.com/ -- The Defence Safety Conference, taking place at the Copthorne Tara Hotel, Kensington, London on the 1st and 2nd October 2018, will feature 8 senior briefings on land safety for the armed forces. Supported by the Defence Safety Authority, UK MoD, the Defence Safety Conference will address the broad spectrum of defence safety across Military Aviation, Land and Maritime. The aim is to identify and promote ‘what works’ and discuss ‘how we can do better’. Including the safe delivery of defence capabilities and the parts that operational users, equipment and service delivery organisations and research and development play in defence safety. The two-day event offers organisations an opportunity to show their commitment to safety and to join more than 250 senior leaders from across the armed forces and industry, to collaboratively raise the importance of safety on the defence agenda.